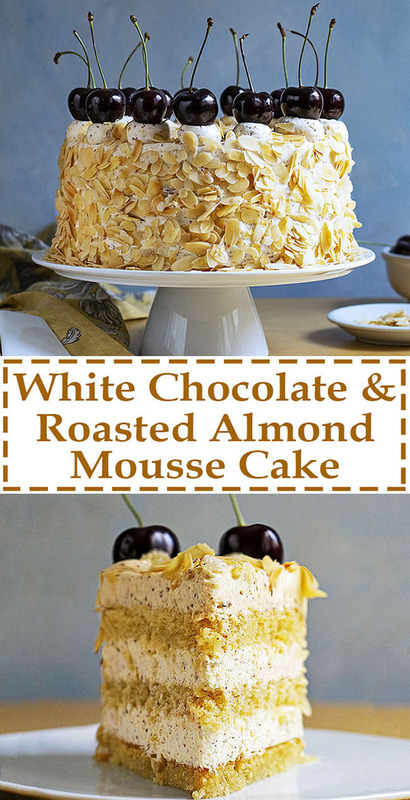 This decadent nougat torte has 3 layers of moist syrupy sponge cake and 3 layers of velvety roasted almond and white chocolate mousse for the ultimate satisfaction! 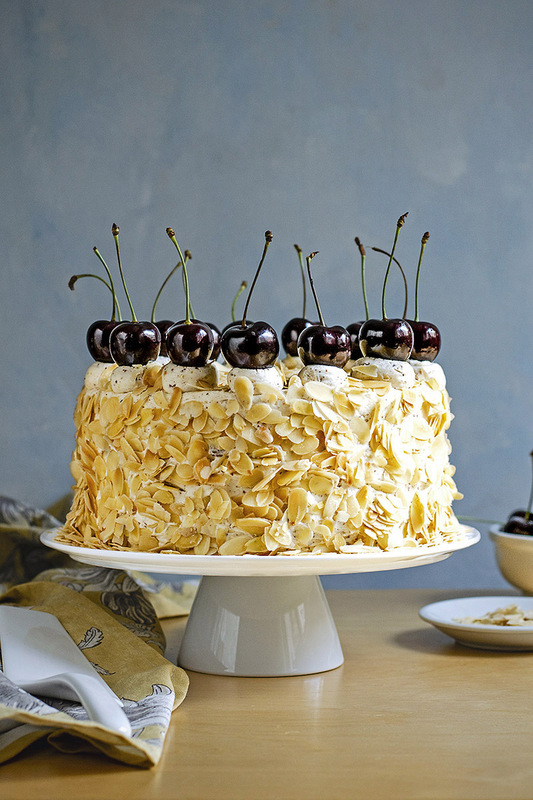 What can I say about this roasted almond and white chocolate mousse cake (a.k.a. 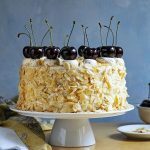 nougat torte)? You actually can smell its deliciousness even before the first bite! The flavor of roasted almonds, complemented by the white chocolate and the flowery vanilla notes, really shines through, making it a very special and beloved dessert. 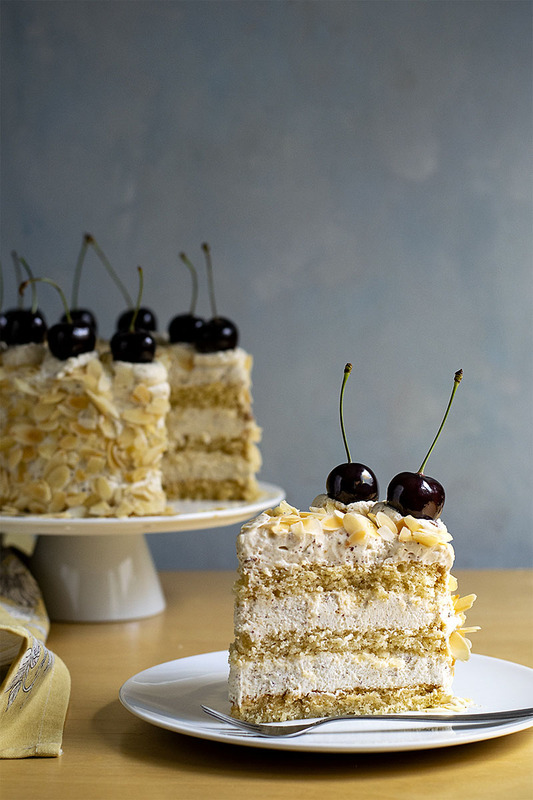 Texture-wise, the moist layers of the fluffy sponge provide just the right base for the velvety mousse to rest upon, and the roasted sliced almonds of the exterior give you that interesting crunch and extra bursts of almond flavor. Some cherries on top work wonders, but you can also use other fruits like peaches, strawberries, poached pears, or leave it plain. A chocolate version of this decadent dessert is the pure chocolate mousse cake (torte) I made some time ago. These are actually my two basic cakes/tortes I often make on special occasions. 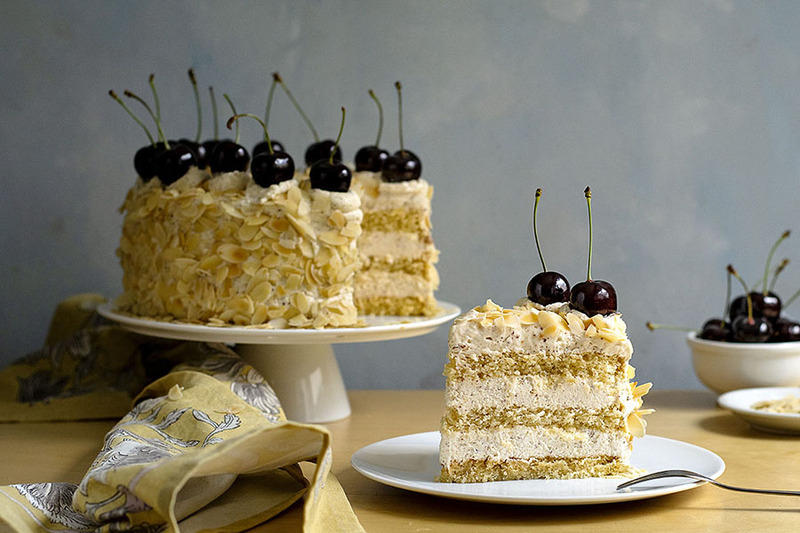 They both are made with sponge cake (genoise), simple syrup, and a mousse filling. 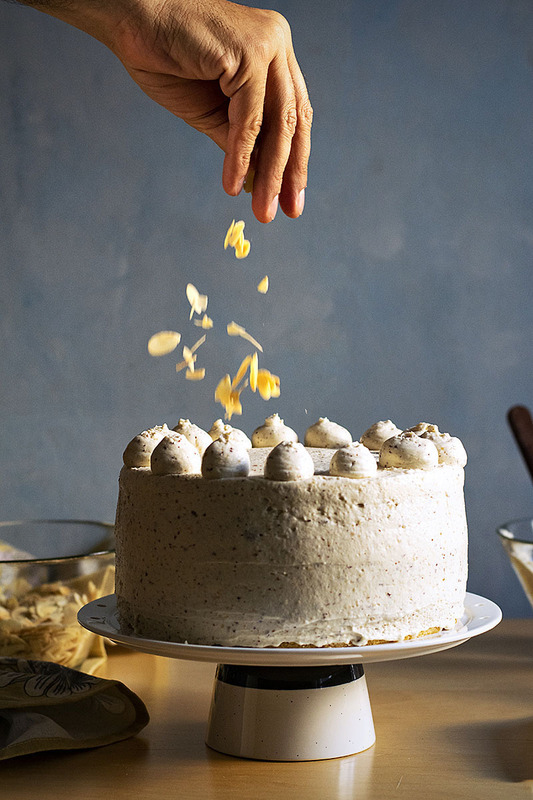 On the other hand, if you want a more traditional, American style two-layer cake filled with buttercream but with a Mediterranean twist, then you MUST make this fluffy pistachio cake with rosewater buttercream! Warm eggs will beat much more easily and faster, so if you have the time, place them in a bowl with warm water for 5 minutes, or stir the egg-sugar mixture over a bain-marie. 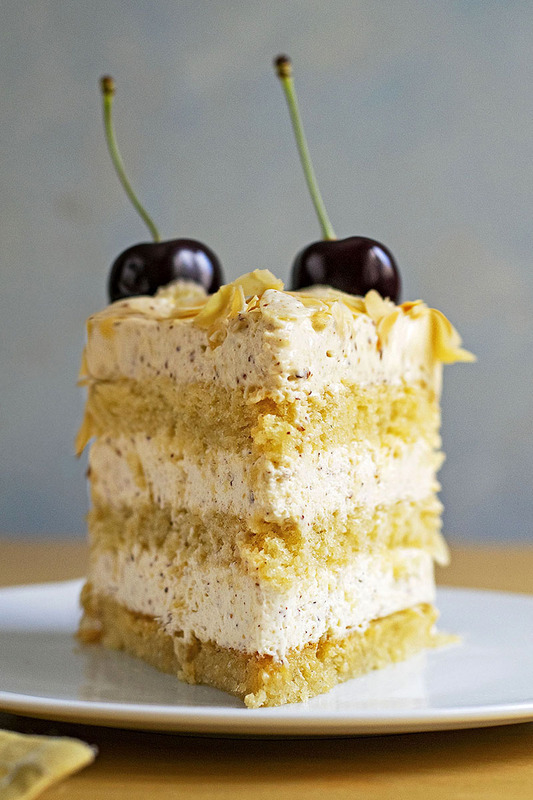 Other than that, the only secret for a perfect Genoise cake is to beat the eggs until they resemble shaving foam. This will give you the upper hand when you start folding the flour into the mixture and help the batter to retain as much air as possible. And remember to fold using a spatula and with a circular motion, from the bottom of the bowl towards the surface! You can find a helpful video on how to fold here. Things are pretty easy here. First, you melt the white chocolate with some of the heavy cream. You can use the microwaves or a small pot and medium/low temperature. Then, you process the freshly roasted almonds until they’re finely ground and mix them with the chocolate. After that, whip the remaining (cold) heavy cream until stiff peaks form. Once again, fold the white chocolate mixture into the whipped cream. The genoise (sponge cake) should be cut into 3 layers. This can be done with a long serrated knife or with a layer cake slicer (much easier!) You can find a helpful video on how to cut a cake in layers here. Refrigerate the mousse until completely set and pipe it, using a piping bag, onto the sponge cake layers. The piping bag will help you achieve thick, uniform layers of filling without the risk of breaking the sponge. Use warm eggs for the sponge cake. Use very cold heavy cream (35% fat or more) to make the whipped cream for the mousse. Use real white chocolate. Choose a white chocolate that contains only cocoa butter as the fat (not any other type of vegetable fat!). Roast the almonds by yourself for the best flavor. Use hazelnuts instead of almonds for a different flavor. Instead of a brush, use an extra large syringe to drizzle the cake with the syrup. It’s very convenient! 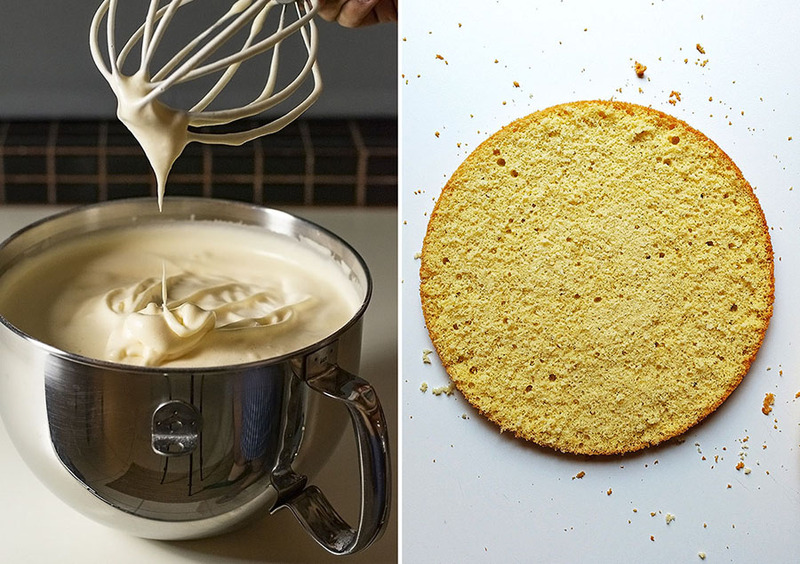 Easier method: You can use a 10-inch (25 cm) round cake pan instead of an 8-inch (20 cm) one, and cut the sponge in half. You’ll end up with two layers of cake and two layers of filling. Make the syrup: Transfer the water and the sugar to a small pot and bring to a boil. Boil for 2 minutes, remove from the heat, add the alcohol, stir, and let it cool. Preheat your oven to 350°F (175°C), grease and flour an 8-inch baking pan and line it with baking paper. Make the sponge cake: Transfer the eggs, the sugar, the salt, and the vanilla to the bowl of your electric mixer and beat on high until the mixture resembles thick shaving foam. Gradually add the flour to the egg mixture folding gently with a spatula. Pour the batter into the prepared pan and bake for about 45 minutes or until a toothpick inserted in the center comes out clean. Run a knife through the edges of the pan, invert on a rack and let it cool COMPLETELY. Make the mousse: In a small pot over medium/low heat, melt the white chocolate with a half cup of the heavy cream, stirring very often. Remove from the heat and let it cool. Finely grate the almonds using a food processor and add them to the white chocolate mixture. In the bowl of your electric mixer, whip the heavy cream with the icing sugar, the vanilla, and the salt until stiff peaks form. Mix about 1 cup of the whipped cream with the white chocolate mixture to lighten it up and then add half of this mixture to thewhipped cream and fold gently using a spatula. Add the remaining white chocolate mixture and fold again until combined. Refrigerate for at least 4 hours or until completely set. Assemble the cake: Using a layer cake slicer or a long serrated knife, cut the sponge cake into 3 layers. Brush the first cake layer with 3-4 tablespoons of syrup and cover with about one-third of the mousse. Top with the second layer of sponge, brush with the syrup and top with the second third of the mousse. Repeat with the third layer of sponge, brush with syrup and top with the remaining mousse. Pipe some decorations if you want and sprinkle the top and the sides with the roasted sliced almonds. Garnish with cherries, if using, and refrigerate until serving. You can make the cake one day in advance since it needs some time in the refrigerator to set properly. You can use a 10-inch (25 cm) springform pan and make two layers of cake and two layers of mousse. 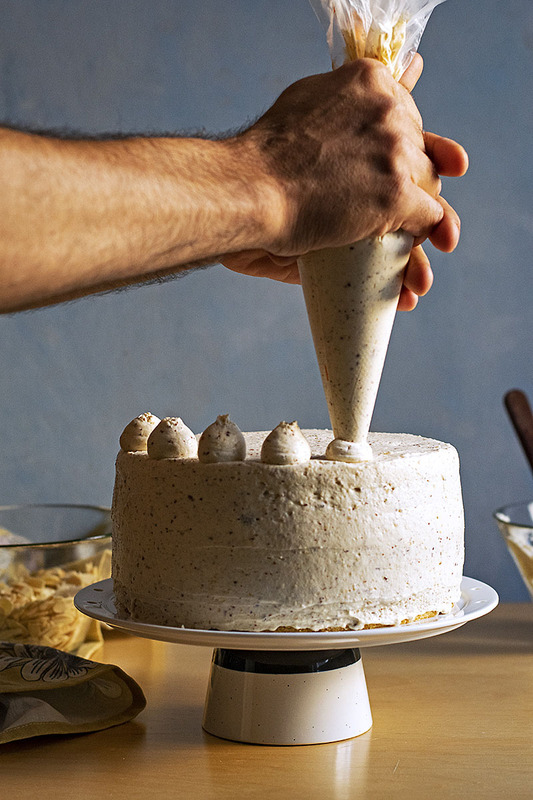 The cake will be wider and shorter, but easier to make and just as delicious! This cake should be stored in the fridge. Preparation time doesn't include refrigeration time. This is one of my favorite desserts! What a gorgeous cake, I will be dreaming of it all day! Those different layers looks fab n beautifully decorated. You are such an awesome baker! This cake is ALL I can think about now!!! It’s perfection at every single level! 🙂 🙂 🙂 thanks so much!